The Grand Champions Villas are nestled in a premier location of Wailea, Maui and provide the experience you would expect from a world-class resort. This quiet, well-managed property features two pools, two whirlpool spas, with barbecue facilities surrounded by lush gardens. Bordering the Grand Champion Villas is the award-winning Wailea Blue Golf Course, the Wailea Gold, with the Wailea Emerald just a short drive away. For the tennis enthusiast, the top-rated Wailea tennis facilities are immediately adjacent to the villas. A short stroll takes you to one of the many world-famous Wailea beaches offering spectacular swimming, snorkeling, scuba diving, or just a day of relaxing on the beach. After a day at the beach or a sightseeing trip, you can enjoy the sunset resting at the pool, or reading your favorite book on your lanai. You can be assured that the Grand Champion Villas will meet your expectations of an unforgettable Hawaiian vacation. Tony and I live in Southern California, married lots of years, have 2 children and 4 grand kids. We purchase this property because of the location, in Wailea , surrounded by the Blue Course with an ocean view. Having 3 bedrooms and 2 baths was the perfect fit for our family, it's very quiet here. We love how big our unit is, the size of the lanai, the beauty of the golf course and the mountain and ocean views from our lanai. It has a lot of natural light, and a separate door from the kitchen leading to the lanai. Over the years we have added a lot of up dates and will continue to do so. TWO BATHROOMS WITH FULL SHOWERS. WE PROVIDE SHAMPOO, CONDITIONER, BODY SOAP AND LOTION. LOCATED ON THE 7TH FAIRWAY OF THE WAILEA BLUE COURSE. VIEW OF THE WEST MAUI MOUNTAINS OFF THE LANI. LOVELY OCEAN VIEW, WITH BEAUTIFUL SUNSETS. TOLL FREE CALLING USA AND CANADA. PURCHASED IN 2011, FRONT LOADER. PARKING JUST A FEW STEPS AWAY FROM CONDO. SPACIOUS LIVING ROOM WITH A 47 INCH FLAT PANEL SCREEN. (2) 47 INCH FLAT PANEL SCREEN IN LIVING ROOM. 32 INCH FLAT PANEL LOCATED IN MASTER. 2 Boogie Boards. Beach chairs, umbrella and ice chest all provided. Tennis courts located just outside property. (2) Both with barbecue areas. Why , oh, why are you sending this to us, we're the owner's...What's wrong with this picture?? WHY OH WHY ARE YOU SENDING THIS TO THE OWNERS! US!! GOD BLESS YOU, NOW THAT EXPEDIA HAS TAKEN OVER!! WE ARE THE PROUD OWNERS OF THIS CONDO 30403 ON MAUI, IN HI. We have travelled o Maui numerous times, this is our 1st stay at the Grand Champions and Bev's condo. Without a doubt this property is the best!!. The owners has thought of everything, a fully appointed kitchen, bathrooms and bedrooms! The 'small details' are awesome which shows the owner really wants you to have a great vacation. The beach supplies are more than adequate (set of 4 of everything - including child beach toys). The central AC is a great feature for cooling all the bedrooms down for the night, although the late day breeze is nice. Bev the owner really cares and one can not go wrong with her property. As you learn about Maui the location is great for all the beaches and shopping you need with a day trip to Lahaina and the north island and 20 minutes to Costco and the airport. Bev thank you for sharing your piece of paradise with us to have a family vacation with our family and grandchildren and make some lifetime memories. Exceeded our expectations and would whole heartedly recommend staying there to all of our friends! The Sacre’s are fabulous hosts. The first things we noticed upon arrival was the fabulous decor inside the home, the view and the closeness of the amenities are a delight. The home was nice and clean and is equipped with basic toiletries all the way through to a fully equipped kitchen (utensils, pots/pans, etc). They even keep some spices in the cupboards and condiments in the refrigerator so that guests don’t have to go and purchase them. Very family friendly and includes some baby items as well! Be sure to check out the beach toys/accessories they have on the lanai. The location is great…being within walking distance to the shops at Wailea and beaches and even if you have to drive anywhere, you are not far from other shopping areas. The Sacre’s made sure to provide information on excursions for all types of tastes. We shopped in LaHaina, drove most of the road to Hana, scuba dove, snorkeled, did lots of walking, shopped and just relaxed. The island offers a variety of restaurants and too many to visit in one trip. For our first trip, our favorite Happy Hour locale was Tommy Bahamas’s. Our #1 dinner spot was Kimo’s in LaHaina (reservations a must) and favorite breakfast spot was the Kihei Café (be sure to arrive early!). We had so much fun we intend to return and spend a few extra days! Thank you Bev and Tony for making our 20th Anniversary and 1st trip to Hawaii such a wonderful memory! Spacious Condo with a great view! We had a such a great time at this condo and the place has tons of space for you to spread out. It was so nice to sit on the lanai and enjoy meals with a view of the ocean and the golfers! The whole family enjoyed both the pools and they are just the right distance away from the unit. The Grand Champions Resort is so peaceful and quiet. 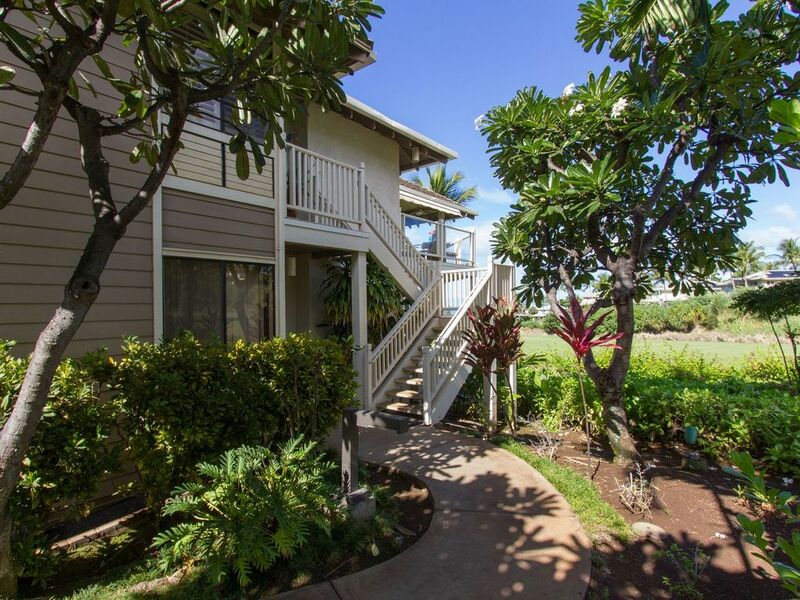 Your 2 minutes to the Shops of Wailea and 5 minutes from numerous beaches! A big thank you to your housekeeper for having the pack-in-play all set up for our arrival. Hands down the best 3 bedroom unit/value in Maui. Can't wait till next year! From the first contact to closing the door on our last day, the condo was a 5-star, perfect "nest" to call ours for a week! Spotless, fully-stocked fab kitchen, breathtaking lanai and lovely baths. An ideal condo for greeting family and wedding guests as they arrived in Maui for our daughter's wedding at Wailea Marriott (and to host a rehearsal on the fairway!) Quiet, peaceful mornings on the lanai with coffee, lovely walk to the beach ... we can't wait to return! Bev was marvelous -- provided directions, complete info packet and spent time via phone recommending restaurants and pre-wedding activities. The condo worked perfectly for 6 (mom, dad, bride, groom, maid of honor, boyfriend and gramma) with room to spare, washer/dryer, beach chairs and toys! We highly recommend this condo! Thanks Tony & Bev! Heaven on earth. Simply divine. Can not wait to go back. Clean, elegant, roomy. The owners are super friendly, helpful and family oriented. We dream about the lani view of the ocean. Simply heavenly. Shops at Wailea, and many beautiful beaches to choose from as well as resorts and restaurants. A 2 night deposit confirms reservation.